Sky Network and fibre areas only. New Fibre Max customers only. We guarantee your download line speed or your money back. Speed measured to the router (not device). Speed check must be done using sky.com/mybroadband (third party data not accepted). £27 Sky Fibre Max for 18 months Sky Fibre areas only. Speeds vary significantly by location. Subject to status. Available to new Sky Broadband customers and new and existing TV customers taking new 18 month subscription for Sky Fibre Max, Sky Talk and line rental. New 18 month contracts for Sky Fibre Max, Sky Talk and line rental required. After 18 months, you will pay the standard monthly price (currently £45.99). ^Speed Guarantee for new Fibre Max customers Speeds vary by location. If the download speed to your Sky Hub drops below your Guaranteed Minimum Download Speed within the first 30 days we’ll give you your money back. Speed check must be done using sky.com/mybroadband. Data from third party speed checkers will not be accepted. Guarantee valid for the first 30 days and must be claimed in this time. Further terms apply. See sky.com/speedguaranteehelp for more. Sky Network and fibre areas only. New Sky Broadband, Talk & line rental customers only. Speeds vary significantly by location. Average download speed shown for fixed line connection to your Hub (excl. Wi-Fi). Prices may go up during your contract. ^Speed Guarantee for new Fibre Max customers Speeds vary by location. Line speed (also known as sync speed) is the max. download speed a line can support, measured to the router. Actual speeds may be lower. Speed check must be done using sky.com/mybroadband. Data from third party speed checkers will not be accepted. Guarantee valid for the first 30 days and must be claimed in this time. Further terms apply. See sky.com/speedguaranteehelp for more. 1. What is the Fibre Max Speed Guarantee? 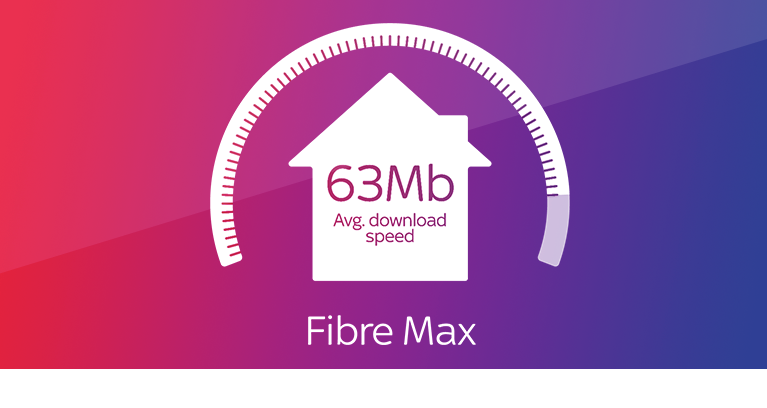 Sky Fibre Max is superfast and totally unlimited, it's ideal for busy homes and we're keen to make sure we give you the best experience. So, if within the first 30 days, your line's download speed to your Sky Hub drops below the Guaranteed Minimum Download Speed we provide in your order confirmation letter or email, you can claim your money back. Find out more. 2. I don't make calls, why do I need line rental? Because our broadband services are provided over your phone line, you'll need to take line rental in order to receive your service. 3. When will Sky Fibre be available at my address? Our Fibre network is constantly being expanded and upgraded. Use our availability check to find out if Sky Fibre is available in your home. 4. How long will my broadband installation take? 1) If you already have an active line - an engineer won't be needed and you can connect your Sky Hub yourself on the install date. 2) If you don't already have an active line - an Openreach engineer will need to install your phone line. This takes approximately 1 hour. The engineer will carry out all work required to ensure the service is up-and-running. This includes replacing a master socket if the existing one is faulty, or installing a new one if none exist. It's worth noting, however, that they will not move an existing socket. 5. I already have a router, can I use the same one when I join Sky? No. You'll need to use your Sky Hub. This allows us to provide an online broadband health check, which gives you updates on the speed you're receiving and the devices connected to your Wi-Fi. It also enables both you and our tech team to carry out checks if there's a problem with your service. The Sky Q Hub is our best ever hub. If you're a Sky Q customer with Sky Broadband or Sky Fibre, the Sky Q Hub turns your Sky Q TV boxes into Wi-Fi hotspots, improving speed and coverage around your home. 6. If I already have an active phone line, do I need to pay for a new one? No. Sky will take over the active line at no extra cost. 7. Can I keep my existing phone number? Yes. In most cases you can keep your current phone number, if requested, when placing your order. We'll let you know if it's not possible. 8. Will you contact my current provider to cancel on my behalf? If you're with BT, TalkTalk, EE, Vodafone or Plusnet; we'll contact your provider for you. If you're a Virgin media customer, you'll need to contact them to cancel your services once your Sky Broadband is active. 9. Has Sky Broadband won any awards? Yes. Sky is consistently ranked as the best broadband provider, including in the Ofcom Complaints Report January 2019. Sky also received the fewest complaints per 100,000 customers measured by Ofcom in its latest Telecoms and Pay TV Complaints Report, comparing Sky, BT, EE, Plusnet, TalkTalk, Vodafone, Post Office and Virgin Media. Not available to existing Sky Fibre customers. New 18 month contracts. Separate contracts apply for TV: £15pm, Broadband Unlimited (including line rental): £18pm and Sky Talk Pay As You Go: £0pm. Sky network areas only. Offer ends 23 April 2019. TV standard set up: £20 for new TV customers; £10 admin fee for existing Sky TV customers without Sky Entertainment. Broadband router delivery charge £9.95 plus £10 connection fee. Standard prices apply after 18 months: Sky TV: £27pm or £22pm if signing up to a new 18 month minimum term; and Sky Broadband Unlimited: £31 pm. 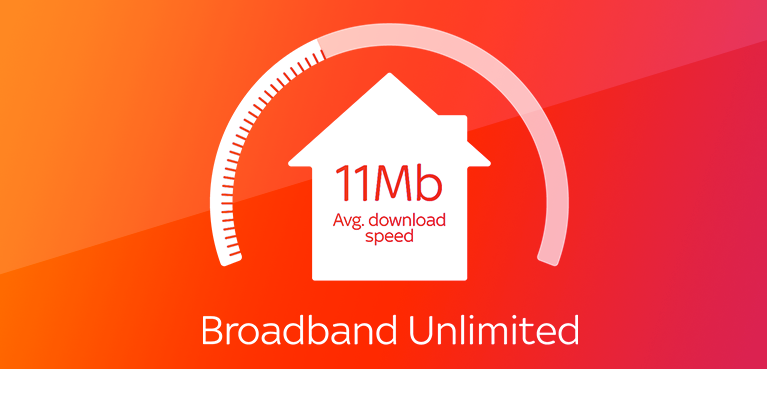 Sky Broadband Unlimited: Sky Network Areas only. See sky.com for more details and our Usage Policies. No traffic management policy for Sky Broadband Unlimited. External Factors such as internet congestion and home wiring can affect speed. Average download speeds 11Mb. Speeds vary by location. Offer not available with any other offers. When it comes to great entertainment and great kit, we’ve got it covered. Place your order with Sky. We'll talk to your current provider to cancel your contract so you don't have to. Around two weeks after you've ordered, your Broadband and Talk will be switched from your current provider to Sky. All you need to do now is connect your Sky Hub - you should only be without service for a matter of minutes. Place your order with Sky. We'll switch on an inactive line (if you have one) or if you don't, organise an engineer appointment to install a new Sky phone line. Look out for a text message from our us to remind you about your appointment a couple of days before. You'll need to contact Virgin Media directly to cancel their services. To help avoid loss of service, it's best to let Virgin know your confirmed Sky activation date so they can cancel their service as close to your new activation date as possible. Choose from our range of Sky Talk packages. Sky Pay as you Talk comes as standard when you buy Sky Broadband or Fibre, you'll only ever be charged for the calls you make. If you're a chatterbox, one of these other packages might be more suitable. Catch up with those who matter most with inclusive calls to UK mobile and landline numbers at evenings and weekends. Enjoy unlimited inclusive calls to UK mobile and landline numbers with Sky Talk Anytime Extra. Keep in touch with unlimited inclusive calls to UK mobile and landline numbers, plus calls to 50 worldwide destinations. Do you have an active phone line? You can still get Sky Line Rental if you already have an active phone line, plus you could keep your existing number. Don't have an active phone line? Sky can install a new phone line if you don't have an active line or if it is not compatible with Sky. All figures, unless otherwise stated are from YouGov Plc. The survey was conducted between 27 October and 14 November 2017. Interviews were carried out online by YouGov panellists. YouGov interviewed a representative sample of online purchase decision makers of broadband. Sky was rated the best broadband provider against major providers - defined as providers with over 10% market share: BT, TalkTalk and Virgin Media - for overall customer service. customer services etc. when using [SUPPLIER] for broadband... Using a scale of 1 to 10 where 1 is 'Very poor' and 10 is 'Excellent,' how would you rate [SUPPLIER] on each of the following attributes? Overall customer service: Sky customers on average rated 7.42 out of 10 which was significantly better than the other major providers' ratings. Sample volumes are as follows: Sky = 2,252; BT = 2,383; Virgin Media = 2,419; TalkTalk = 1,084. For more information, please contact YouGov directly.